When East Kentwood native Sekayi Bracey was just 8 years old, her elementary gym teacher encouraged her to pursue running. Eleven years later, she’s still running and can claim 10 individual state titles earned during her high school track career. Sekayi also earned a spot on the women’s track team, with a full-ride scholarship to Purdue University in Indiana. Not long after being discovered by her teacher, Sekayi began running competitively. 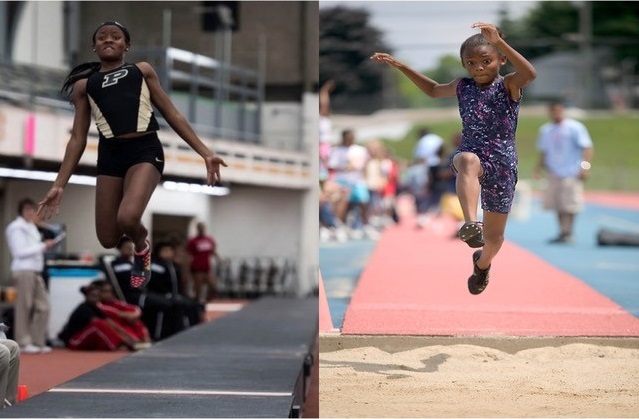 In 2006, when she was 8 years old, Sekayi ranked third in her age group for the long jump and 200-yard dash in the state. The Youth Grant Committee at the Grand Rapids Community Foundation awarded a grant to the track program that year and Sekayi was featured in our annual report for 2005-2006. She’s a college freshman with aspirations to work in forensics someday. Another one of her major goals is to compete in the 2020 Olympics. “That has been my dream since I was 8, so I really am seeking to fulfill that,” Sekayi said. Her personal records include a 100m dash of 11.68 seconds, 200m of 23.61 seconds, 60m of 7.41 and a long jump at 19 feet, eight inches. Growing up, her role model was Florence Griffith Joyner (Flo-Jo) who is considered to be the fastest woman of all time. Sekayi said that having the ability to inspire people, like Flo-Jo, makes her want to have an impact in the running world. “God got me to the place I am today, and he has blessed me with a gift,” she said. This story was written for Grand Rapids Community Foundation by PR Intern Jacquelyn Zeman.